The German city of Bremen is famed for maritime trade and peppered with many ornate and quaint old world architectures. 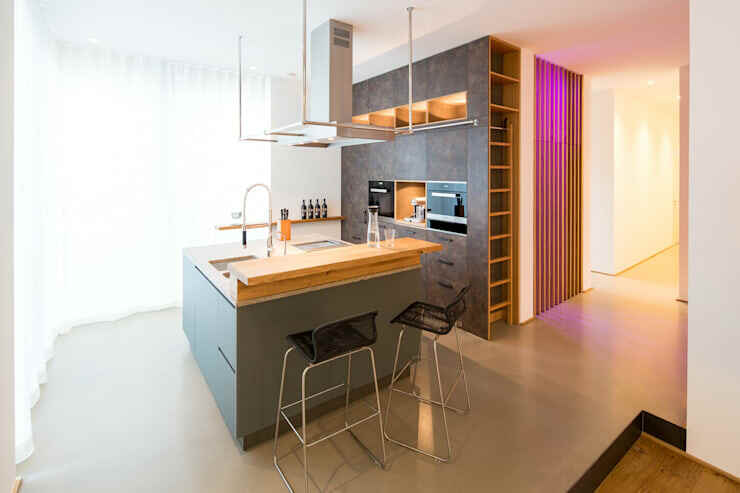 But today, we will take you on the tour of a contemporary design wonder with this Einfamilienhaus Neubau , a smart and quirky abode filled with ultramodern designs, elegant hues and brilliant lighting systems. Simple but trendy furnishing and unique functional hacks make this house convenient, cozy and soothing. 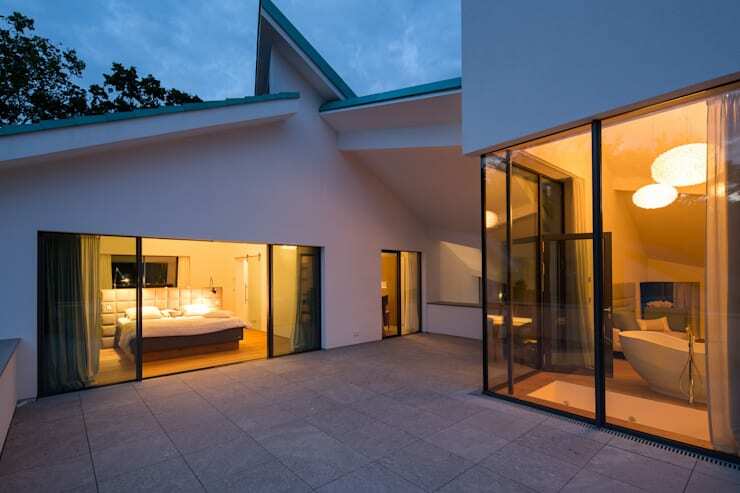 Glass has been used tastefully to integrate the lush garden and airy terrace with the interiors nicely. 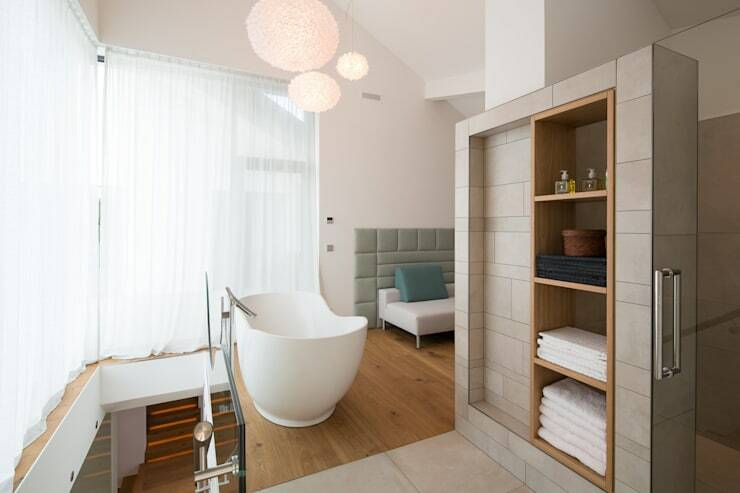 Designed by the interior architects at Schulz Rooms, this residence will inspire you in many ways. Rendered in sophisticated shades of grey, white, and decked with slim wooden accents, the kitchen is a contemporary and stylish place to prepare yummy meals. A couple of minimalistic high chairs allow you to grab a quick bite at the wooden breakfast nook, while chrome appliances and sleek fixtures lend a smart vibe. Glass doors with sheer drapes bring loads of sunlight inside. 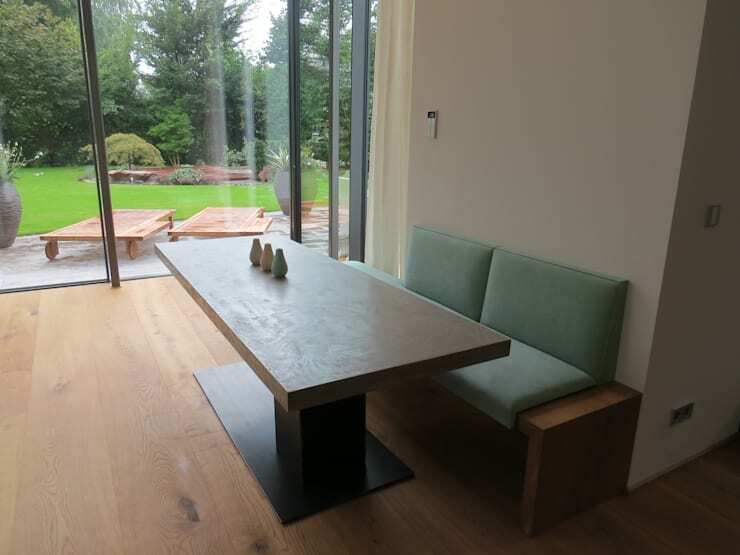 Sleek furniture in wood and pastel hues promises comfy mealtimes, while large glass doors let you soak in the beauty of the verdant garden outside. Seating arrangements on wheels allow you to unwind outdoors and breathe in fresh air or sunbathe. 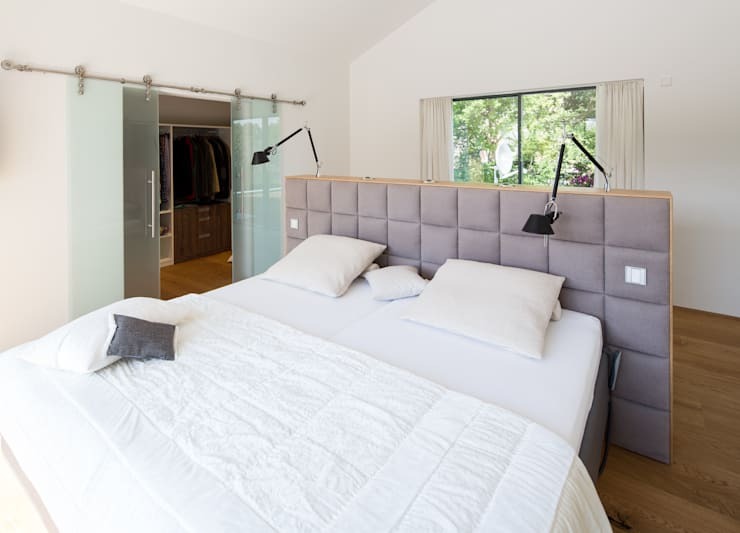 A plush white bed with a cushioned grey headboard takes the centre stage in this minimalistic and comfy bedroom. The reading lamps have been cleverly fixed on the headboard to avoid introducing side tables, while neat glass doors slide open to lead you to the walk-in closet. Cosy white walls, warm wooden floor, large glass windows adorned with dreamy drapes and a sensuously curvy tub make the atmosphere perfect for lavish spa sessions. Quirky pendant lights contribute to the romantic aura, while a stylish grey and stone-finish shelving unit offers storage solutions. 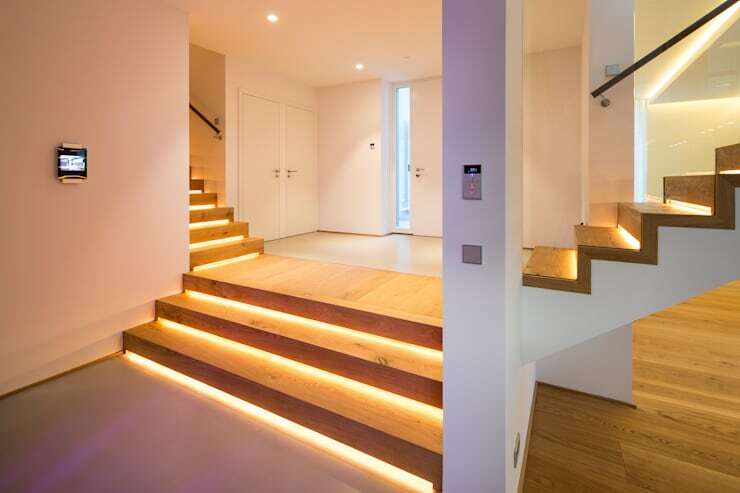 The wood and white stairways in this home have been gorgeously illuminated at each step to make ascent and descent a dreamy experience. Glass balustrades ensure that the feeling of openness prevails. Paved with grey stones and surrounded by the quirky lines and angles of the structure, the terrace is a chic and airy place for indulging in outdoor relaxation. Softly glowing interior lights from the bedroom and spa filter through the glass doors to make the terrace a subtly magical space. The quirky and unique spirit of the home becomes yet more evident when we take a look at its exteriors. Sharply sloping roofs, futuristic chrome elements, and the way hints of turquoise pairs with white and textured grey are simply fascinating. Hope you gleaned lots of smart and trendy ideas from this home tour. 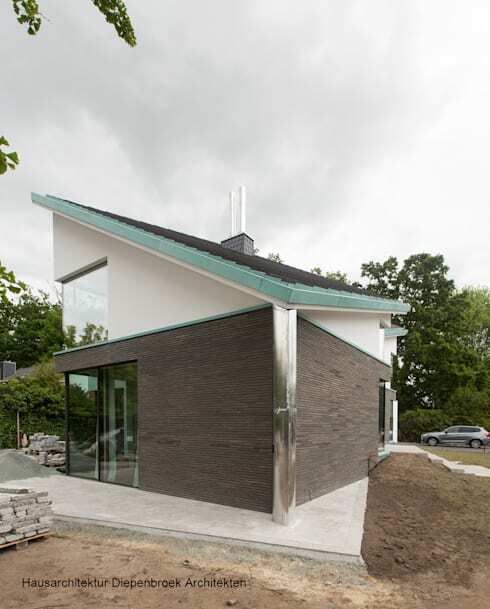 Check out another story for more inspiration – A Couple Builds a 500 ft² Home – With Love and a Small Budget.